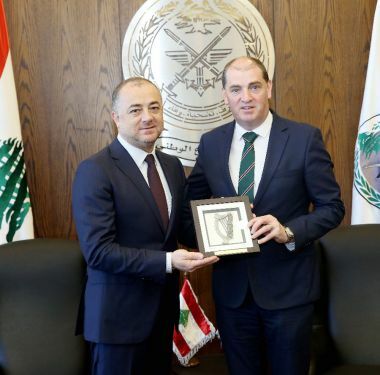 Lebanon - National Defense Minister, Elias Bou Saab, welcomed on Monday his Irish counterpart, Paul Kehoe, who congratulated him upon assuming his mission as Lebanon’s defense minister. The meeting focused on the activities of the Irish contingent that has been operating within UNIFIL forces since 1982 in south Lebanon. The pair also broached the means to expand the framework of cooperation between the Lebanese and Irish armies to cover other areas. The Syrian refugee crisis in Lebanon was also discussed and Minister Bou Saab explained the difference between “a safe return” and a “voluntary return” of refugees. “The term ‘safe return’ should be used,” Bou Saab said, expressing reservations on the use of any other. “Lebanon can no longer bear the refugee crisis burden and can not wait for a political settlement in Syria to resolve this crisis," he added, stressing that Lebanon wishes a safe and dignified return for refugees. After expressing total understanding vis-a-vis Lebanon’s position from the refugee crisis, the Irish Minister expressed hope that Lebanon would vote in favor of his country’s non-permanent membership in the Security Council for the years 2021 and 2022. Bou Saab stressed that according to his most recent information that the Lebanese Foreign Ministry had informed Ireland of its supportive position for Ireland’s candidacy. Minister Bou Saab later met with Sweden's Ambassador to Lebanon, Jürgen Lindström, who congratulated him on his assumption of the defense ministry portfolio in the Lebanese government.